We came upon Kappou Gomi purely by chance. 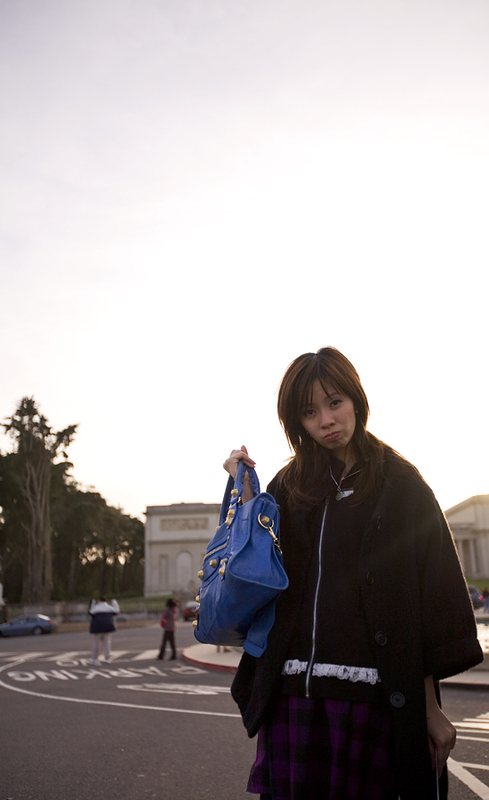 After checking out the Cartier exhibit at Legion of Honor, we wanted to get a quick snack before dinner so we drove up Geary until we found parking, then walked around to see what was in the area. To be honest, I was really craving Frjtz’s fries, but considering we were “far” from Mission, we searched for alternate fries or related fried-snack-junk-food. 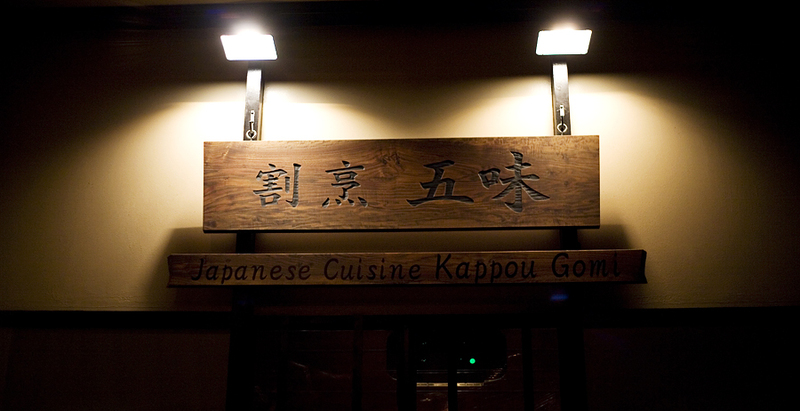 When we walked past Kappou Gomi, there was nothing memorable about the entrance. 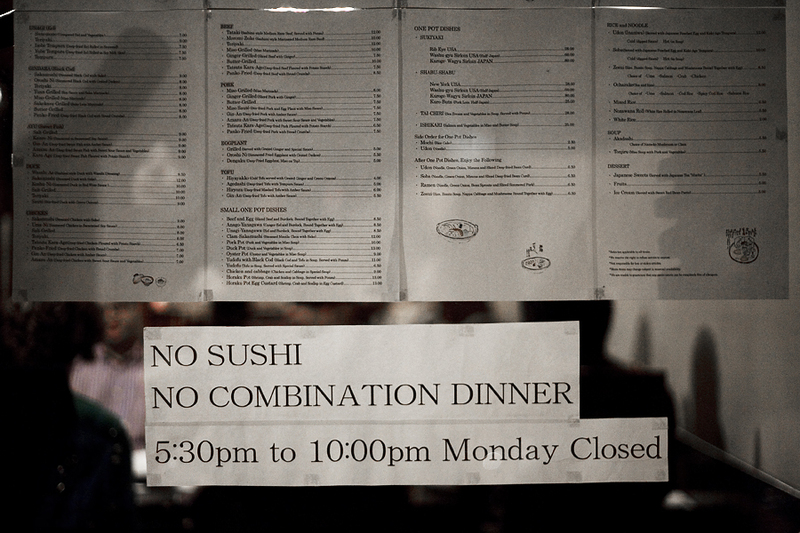 It was standard decor for a Japanese restaurant and the window had unattractive copies of the menu taped up… and signs that said NO SUSHI and NO COMBINATION DINNER. 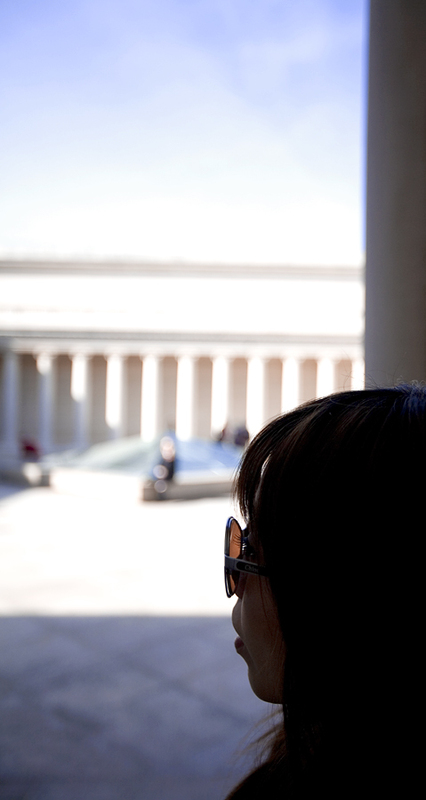 What we did notice was that there were groups of people congregating around the front door and checking out the menu. Curious, we took a peek at the menu to discover that the menu was organized not by course, but by type of fish, seafood, or meat. Each item had a heading: Hamachi, Hotate, Uni, Hirame, Toro, etc. Under each heading, the subheading listed the different preparations for that fish. 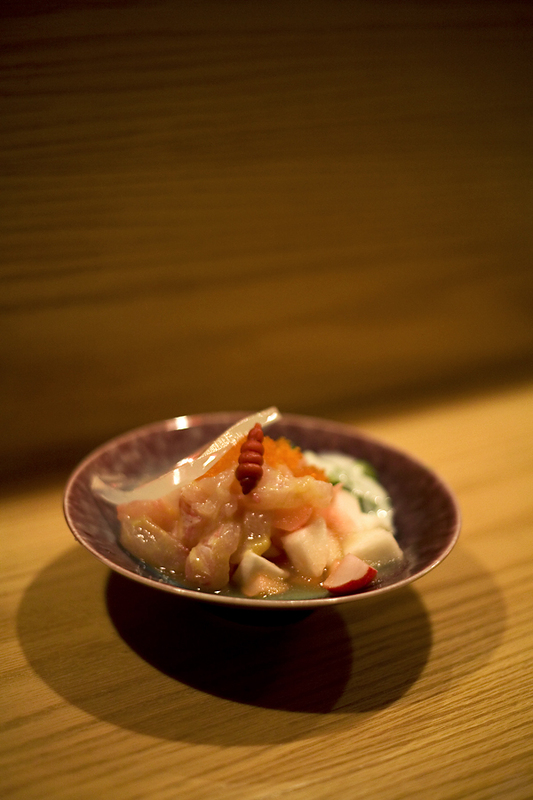 For example, under hamachi, there was hamachi sashimi, hamachi miso, hamachi grilled, etc. No further description was given. This all seemed very intriguing, but we had planned to go to “Beatles” Yakiniku (Halu), figuring it would be a low key place on Valentines Day. After walking around Geary some more and discovering a tasty Russian bakery (with real Russians inside) as well as an Irish bakery, we were considering going to Kappou Gomi. To help our indecision, we stopped inside a Starbucks to deliberate. A quick search on yelp revealed positive reviews and some delicious looking pictures. NOT helpful. So we decided to flip a coin to decide, and by coin, I mean, I opened up my iPhone dice app and shook the iPhone. Even means we would go to Kappou Gomi, and odd we would go to Beatles. We “rolled” an odd. YAY, that’s what I wanted anyway. 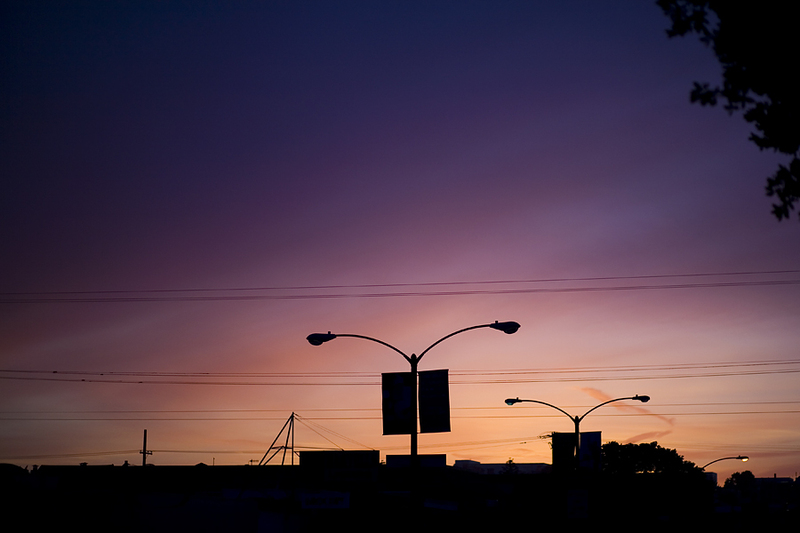 We drove down about twelve blocks and started looking for parking. After circling a few blocks I thought “Maybe we should see if they are even open”. Damn it, they were closed. Back to Kappou Gomi we went. 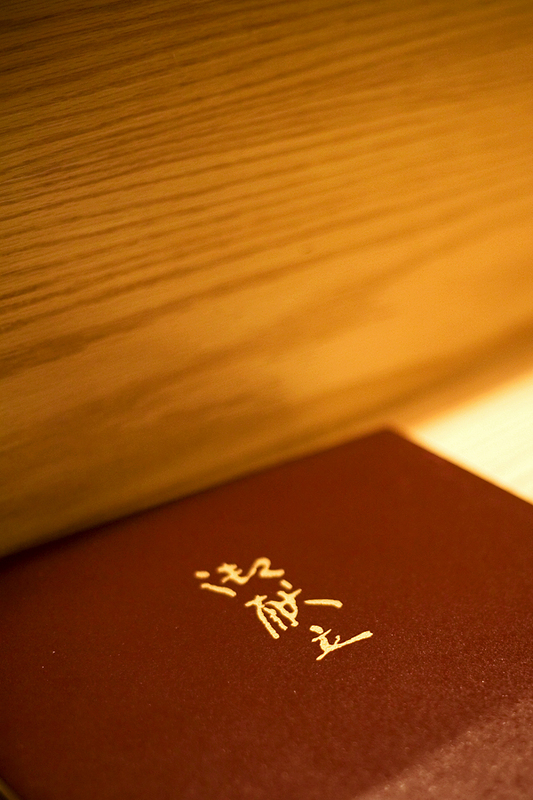 We skimmed the large menu. We noted a couple interesting items: grilled uni, panko fried tako, hirame with lime, hamachi with miso, duck sashimi, beef sashimi. 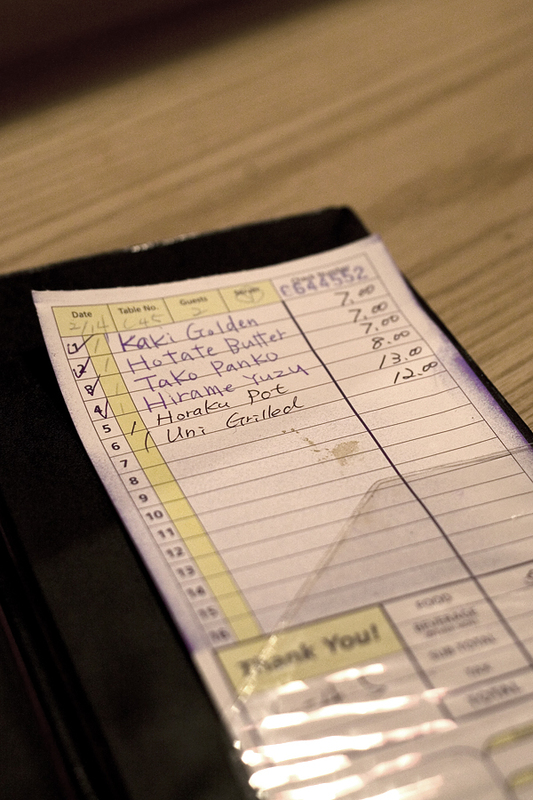 The first round, we ordered the panko tako, the hirame yuzu, the kaki golden, and the hotate butter. 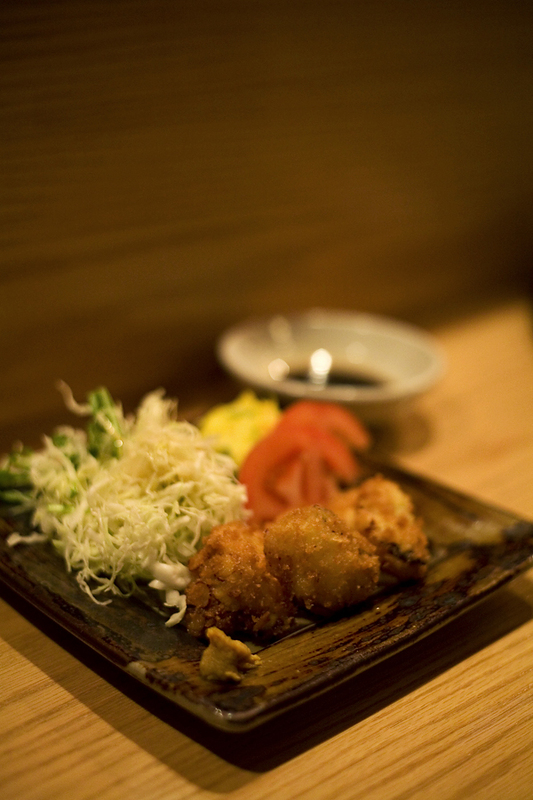 The panko fried tako (octopus) came first. The shape and texture made them similar to little chicken nuggets. It was fried nicely but I thought that the tako was a little chewy, either due to it being slightly overcooked or due to the meat being sliced too thick. 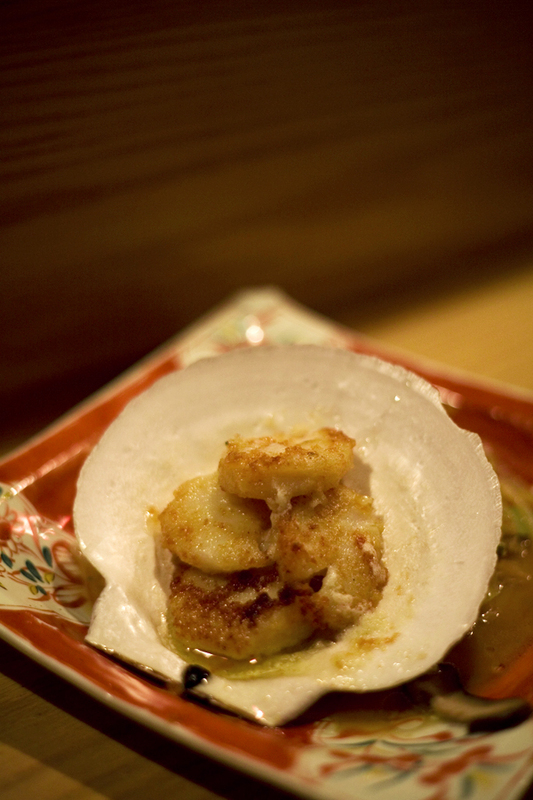 The hotate(scallop) butter looked essentially like scallops sautéed in a lot of butter. The taste was very good, but again, it was just barely overcooked for me. The scallops were complemented with a warm noodle and bean sprout stir fry. The kaki (oyster) golden was pretty good, I think. 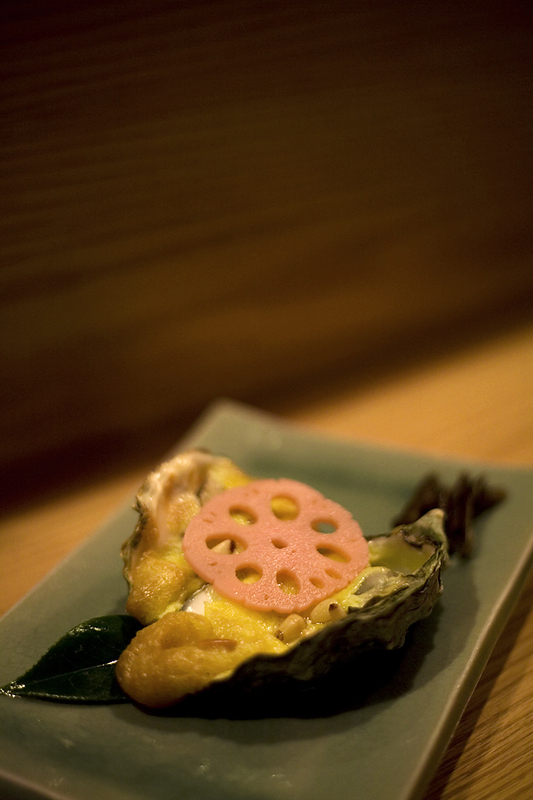 I honestly don’t remember what it tasted like, but a nicely cooked egg + oyster + lotus root MUST = win right? I think it had pine nuts too. We ate the hirame (flounder) last in this batch because this dish was cold. The hirame tasted very fresh and went well with the radishes and other veggies. This simple but tasty dish seems like it could be easily replicated at home with fresh ingredients. Because of the vague menu, we did another search on yelp to see what other people ordered. Someone had posted that the duck sashimi was not as “sashimi” like as they thought, so we crossed that one off the list. 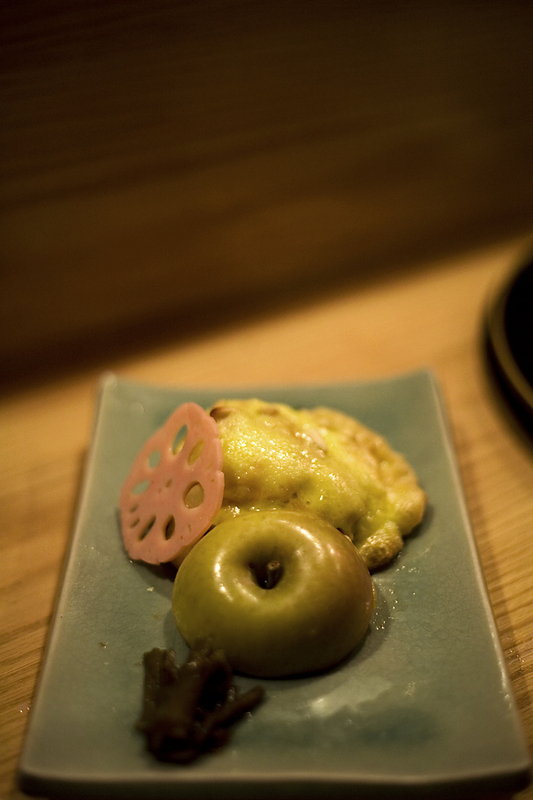 Another posted that the grilled uni came with an apple… interesting. We decided to order the grilled uni and the hotaku pot. 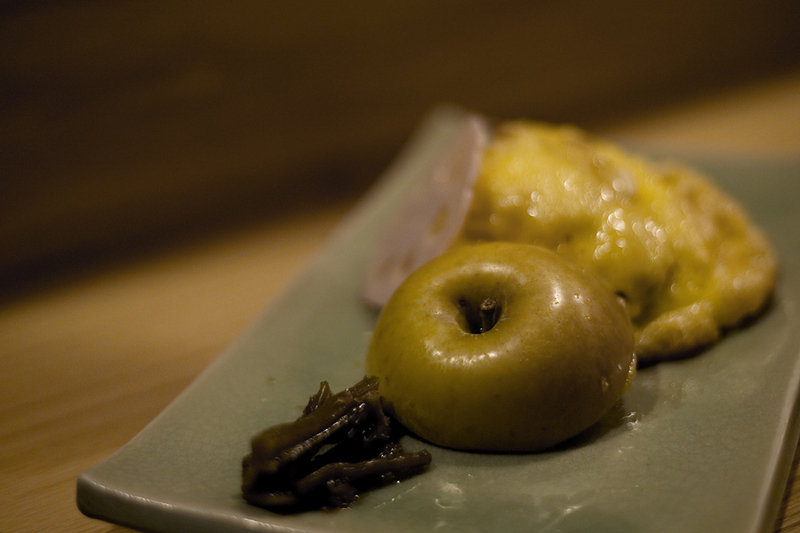 The “grilled uni” indeed did come with an apple. I’m not even sure if the uni itself was grilled, but the uni was stuffed inside half of a mostly hollow apple and covered with what appeared to be a steamed egg, with pine nuts. The apple itself was also grilled. This franky, unthinkable combination was awesome. The warm uni was very fresh and tasted heavenly with the egg. The pine nuts added a bit of crunch. The dish felt surprisingly heavy, in a good way. Then, we ate it with the apple.!!! If you told me uni with egg with a cooked apple would taste great together, I would have never believed you in a million years. I hate apples and I hate cooked apples even more, but this was the best dish all night. I don’t think I could describe it well enough to do it justice… but it was really really good. 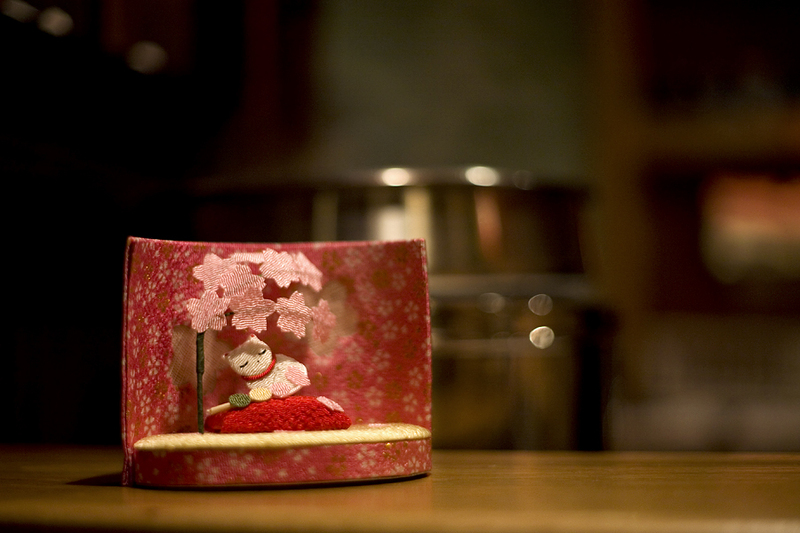 The last thing we ate was the hotaku pot with seafood. 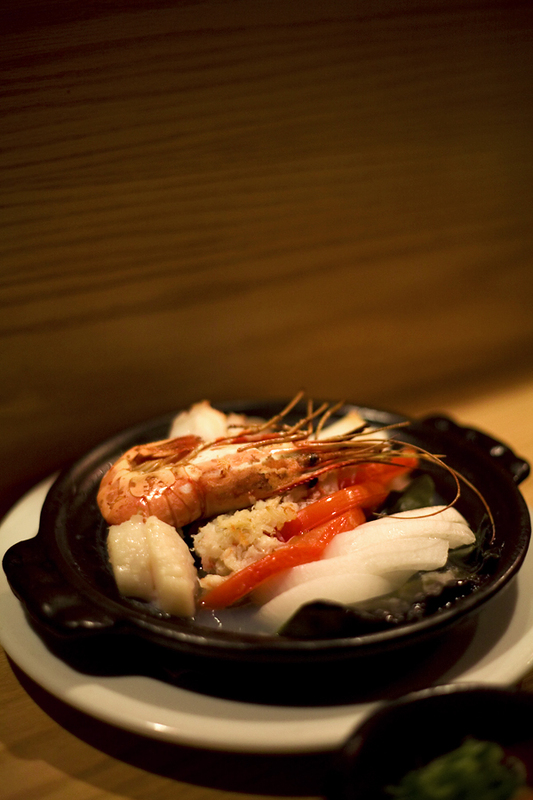 This mini nabe had one large shrimp, one scallop, some slices of octopus, squid?, clams? and some tasty onions and tomatoes. I was really surprised by the quality and freshness of the seafood. Usually in these “seafood” mix plates, they throw in some small junky shimps and clams and call it a day. Not in this pot. Every piece of seafood was fresh and perfectly cooked. I don’t think we ordered that much food, but after the uni, we were feeling both full and satisfied. My only real disappointment was forgetting to order the beef tataki (sashimi style) and not having the stomach capacity to order more food. Considering how many more items there were to try and how yummi the food was, we definitely plan to return. Good Marning! 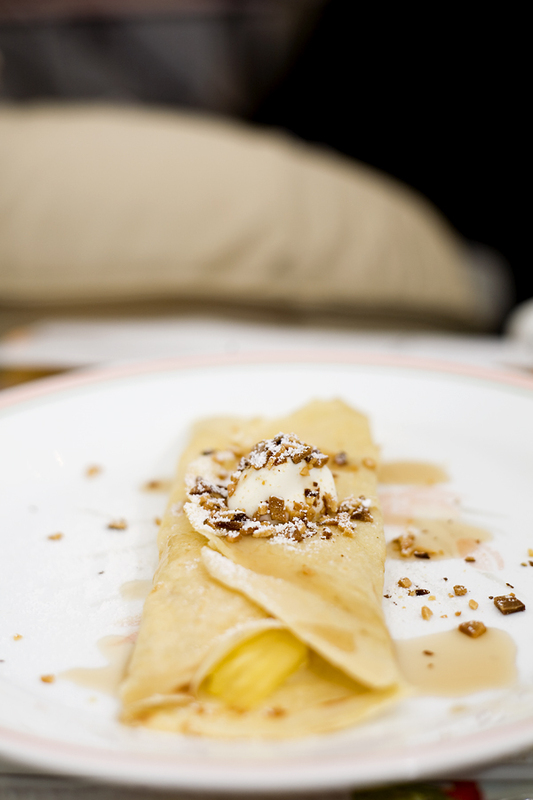 Hare is a crepe. It has pine apple. And Cream. Wat are you lookings. Not thair yet. You can sails your bag later.